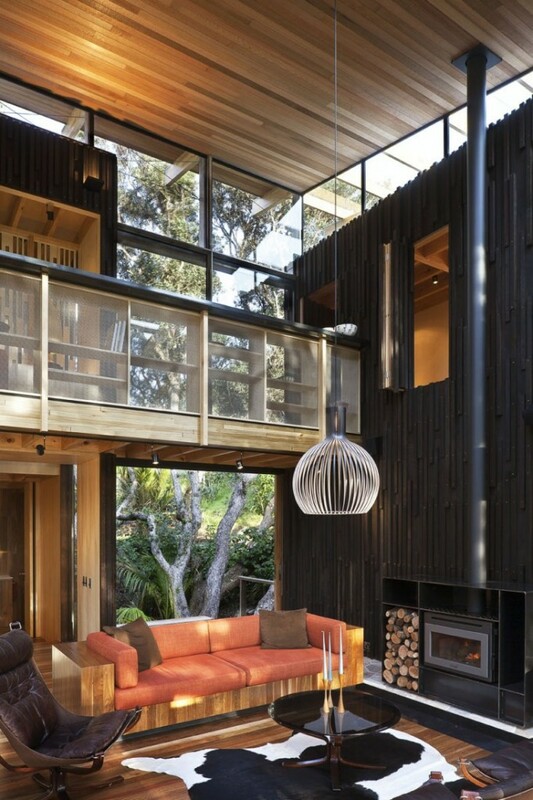 Herbst Architects recently completed a beautiful home under the trees in New Zealand. When we say "under the trees" we mean it! 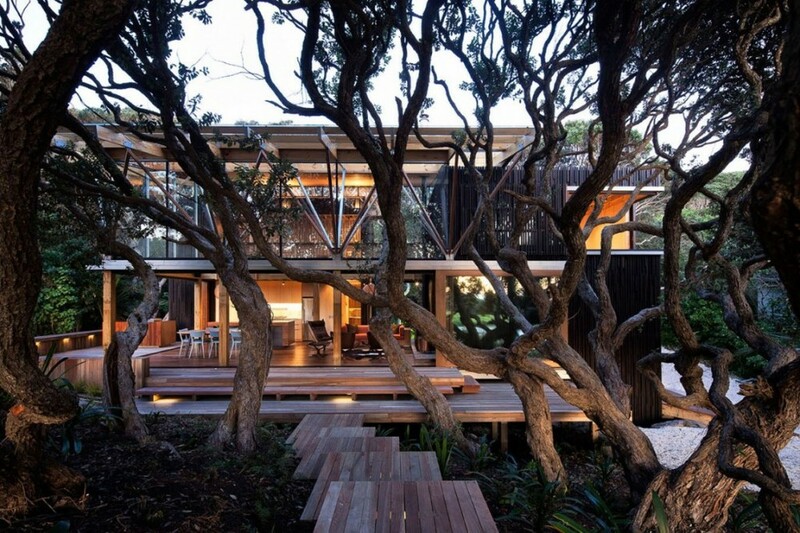 The property was 90% covered by Aukerlands native Pohutukawa trees, which created a challenge for Herbst, a New Zealand based architecture firm founded in 2000 by Lance and Nicola Herbst. "In order for the home to exist it would require the destruction of a large number of mature trees. To do this we looked to the trees themselves to give us the cues that we needed," the two architects explained. "We separated the brief loosely into private and “public” components, giving us smaller individual masses with which to articulate the forms. The private functions of bedrooms and garage are housed in two towers which are construed as freshly sawn stumps of the trees that were removed. To allude to the bark of the stumps the skins of the towers are clad in black/brown stained rough sawn irregular battens. The interior spaces are then seen as carved out of the freshly cut wood, achieved by detailing all the wall / ceiling and cabinetry elements in the same light timber." After working around the tree issue, Herbst put their minds together to design the interiors. Warm woods were used on the walls and furniture with a complementary color scheme of oranges, tans, and browns to keep the interiors cohesive with the exterior architecture. The living room became the featured space of the home, with its large ceilings, fireplace, welcoming furniture, and unique lighting; Herbst created a comfortable and contemporary place for story telling and hosting. Part of the living room opens up to the forest, letting natural light and ventilation to breathe into the space. 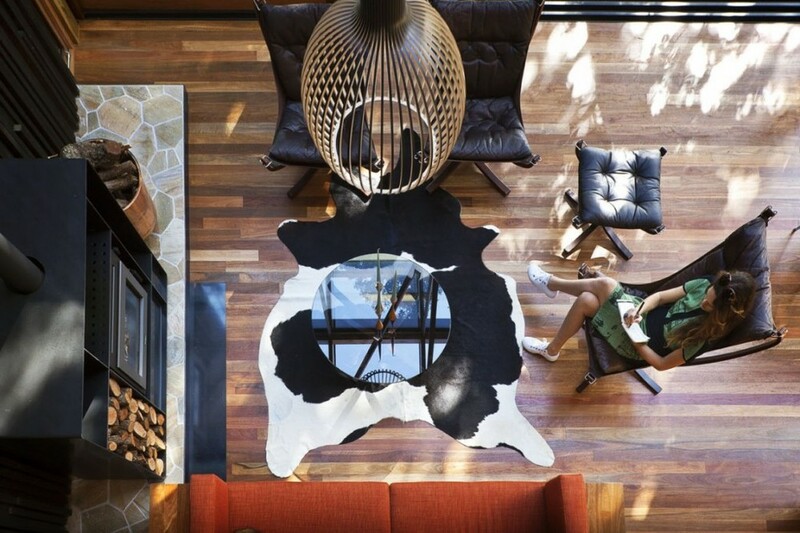 The living room and other piblic spaces are the main areas that link the private spaces of the home. A walkway links the towers at the upper level allowing engagement with both the natural and man made canopies. 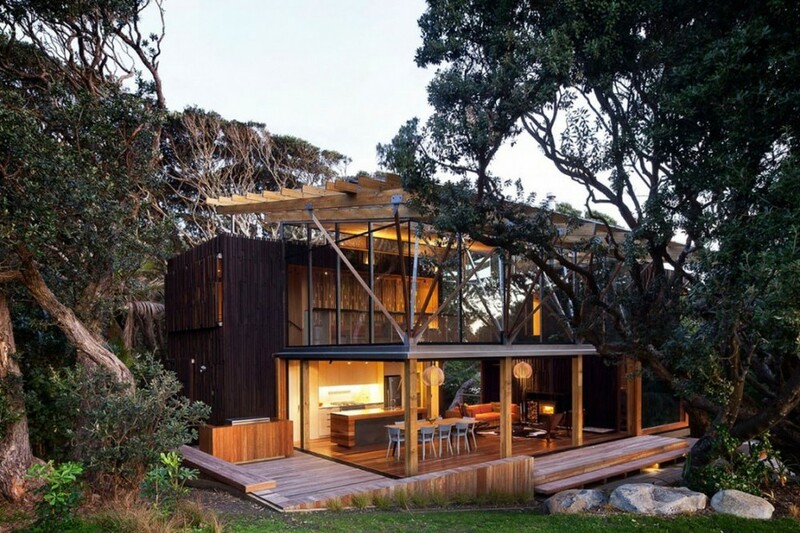 The Pohutukawa home is designed to be the perfect get away, secluded, a chance to re-connect with nature.